How much of the Smoky Mountains have you explored? Whether you visit annually or are planning your first visit, the Great Smoky Mountains National Park is a diverse mix of wildlife, wildflower and habitats. To explore the park with experts who know the backcountry, the Gatlinburg Special Events department is offering free guided nature walks this spring. Those who want to explore the National Park with an expert have the opportunity during free April Nature Walks with Naturalist Jamie Matzko. As a leading expert in Smoky Mountain nature, Matzko will be leading visitors through unique habitats to take a look at wildflowers, wildlife and forests. Each of the Naturalist Tours begins at the Sugarlands Visitor Center. Former U.S. Fish and Wildlife Service Bird Biologist Keith Watson will lead birdwatching walks during the peak of migration season in May. As an expert on Smoky Mountain songbirds, Watson tours are a treat for those interested in flight patterns and bird behavior. His two hour tours will lead you through the mountains to identify birds by sound and appearance, so don’t forget a pair of binoculars. To participate in the guided walks, you can register in advance by calling (865) 436-0505. If you and your family would rather explore the Great Smoky Mountains National Park without a guide, there are maps and guides at any of the four visitor centers. The most convenient to Gatlinburg is Sugarlands Visitor Center, open each day at 8:00am. Here you can view exhibits and purchase books, maps and guides. Once the family is ready to explore, there are tons of options for a half or full day of fun in the park. Those who want adventure can take a hike or bicycle along one of the trails. If you’d like to spend time on the water, fishing and waterfall hikes are two of the most popular options. Anyone who wants to enjoy the scenery without working up a sweat can enjoy a picnic before a scenic drive through one of the National Park’s auto touring roads. 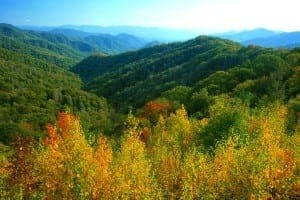 Ready to see a Smoky Mountain spring in person? Aunt Bug’s Cabin Rentals welcomes vacationers to our cabin rentals in Gatlinburg, just minutes from the Great Smoky Mountains National Park entrance. Our guests have spectacular outdoor views and luxurious amenities inside and out. Check out our cabin inventory today to find the cabin your family can relax in after a long day of exploring the mountains.